FOR CLOSURES, AND ASSEMBLED PACKAGING PRODUCTS. Auting has over 20 years of experience as a manufacturing company of automatic assembly machines. In the process we’ve developed our own feeding systems. We have a wide range of vibratory feeders , rotary feeders , hoppers, sorters , and conveyors, that you will find being used in a wide range of industries such as; plastic, pharmaceutical , beverage, auto, and housekeeping industries, to mention a few. parts, giving to our customers the best way to move parts to the workstation . 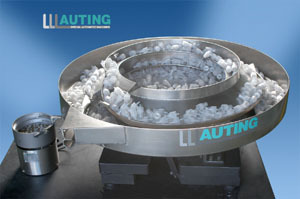 Auting can design, build and supply from a single vibratory feeder or Hopper to a complete turn key assembly line. Our feeding systems are built using materials and techniques that will handle your parts smoothly and with great care, and deliver them to the next operation damage-free. Every project is different, so it needs a different approach, therefore our R&D and experimental department, working with creativity, flexibility and in teams, solve our client’s feeding problems under these premises. Quotation of equipments with high productive capacity. Simplicity and reliability, with an easy access and repeatability in tooling change.